This bloodtrail is 100% real. All the pictures and steps are as it happened during a Kansas Deer hunt in December, 2005. Good Luck! It is the second to the last day of your late December Kansas Whitetail hunt at Cimarron River Outfitters. This beautiful PY 10-pt walks under your stand, feeds and then spots you. 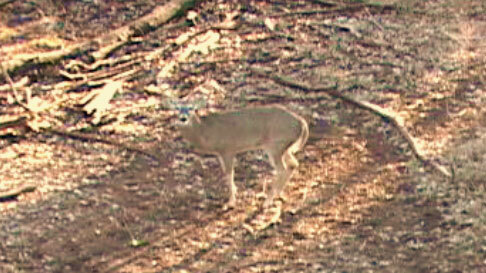 You are already at full draw when this buck makes eye contact. Look closely at the photo - you are lined up perfectly with the camera. 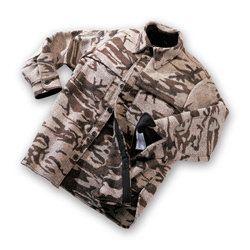 The Bushman has traditional shirt-jac features that make it a good all-around shirt for bowhunting, back-country rifle hunts or just wearing around camp. It is a full-front, button-up shirt with a ventilated, double-yoke front and back to shed rain and snow. It has two No-Snag chest pockets with built in shell holders. We added elbow patches and our ultra-quiet concealed-button system. Which statement below is not true?